Franz Fischer was educated as a cellist and was engaged at the opera of Pest in 1870. He was supported by Hans Richter and in 1875 he became acquainted with Richard Wagner. In 1876 he directed the choir during the first performance of Wagner's "Ring". From 1877 to 1879 he was court conductor in Mannheim and from 1879 to 1912 in Munich, where he was ennobled. He directed Wagner's "Parsifal" in Bayreuth during the Festspiele of 1882, 1883, 1884 and 1899. On 29 Jun 1888 he was the conductor of the posthumous premiere of Wagner's "Die Feen". This opera was found after Wagner died in 1883 and the original manuscript disappeared in 1945 when it was in the posession of Adolf Hitler. On 22 Jan 1899 Fischer conducted the première of Siegfried Wagner's "Opus 1". 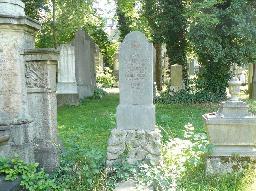 The grave of Franz von Fischer at the Alte Südfriedhof, München.